<h2>Preparing for extreme weather</h2><br /><p>Most scientists predict that climate change will lead to <a href="https://www.sciencedaily.com/releases/2017/03/170320085442.htm" target="_blank" rel="noopener noreferrer">worsening weather</a>. This could include more severe snow storms, heavier rainfall and wildfires. These can have disastrous effects on our transport network, causing critical tunnels or bridges to close and, in the worst circumstances, leading to injuries and fatalities. The cost of infrastructure collapse from weather is estimated at <a href="https://www.safeway-project.eu/en/project/benefits" target="_blank" rel="noopener noreferrer">€29 billion</a> a year.</p> <p>‘The general idea is that these types of extreme weather events will get more and more (severe) in future,’ said Dr Angelos Amditis from the Institute of Communication and Computer Systems (ICCS) in Greece. ‘This will be a major issue for our society in the future, and this will really affect our daily lives and ways of moving, working or living.’</p> <p>He is one of a number of researchers who are now studying how we might cope with these situations. They are hoping to develop technologies and methods that can help people and emergency services get real-time information on any serious events, and plan accordingly.</p> <p><strong>Critical</strong></p> <p>Dr Amditis runs a project called <a href="https://cordis.europa.eu/project/rcn/215997/factsheet/en">RESIST</a>, whose goal is to ensure that critical parts of our transport network can cope with extreme events, both natural ones like weather to human-caused events like cyber-attacks.</p> <p>To do this, the project, which began in September, will be focusing on two important transport routes – the T9 bridge in Greece, and the Saint Petronilla tunnel in Italy – both of which, if shut down, would cause huge problems. A pilot project to test extreme weather resilience will be carried out at the former in February 2021, and the latter in July 2021.</p> <p> <div class="quote-view quotesBlock quote_horizontal"> <div class="quotesTop"><img src="https://horizon-magazine.eu/sites/all/themes/horizon/images/quotes_top.png" alt="" title="" /></div> <p>'(Extreme weather) will really affect our daily lives and ways of moving, working or living. '</p> <blockquote><p>Dr Angelos Amditis, Institute of Communication and Computer Systems, Greece.</p></blockquote> <div class="quotesBottom"><img src="https://horizon-magazine.eu/sites/all/themes/horizon/images/quotes_bottom.png" alt="" title="" /></div> </div> </p> <p>When it comes to extreme weather, these roadways are most at risk from heavy snowfall and rainfall, with flooding in particular being a serious concern. In such cases, bridges and roads can be closed for hours or even days, leaving many people stranded on either side as they are unable to travel.</p> <p>‘If you just lose one road you can usually find a way to go around it,’ said Dr Amditis. ‘But if you lose a tunnel or bridge, then you have more critical problems.’</p> <p><img class="@alignleft@" title="On average, the number of hydrological events such as floods around the world quadrupled between 1980 and 2017. 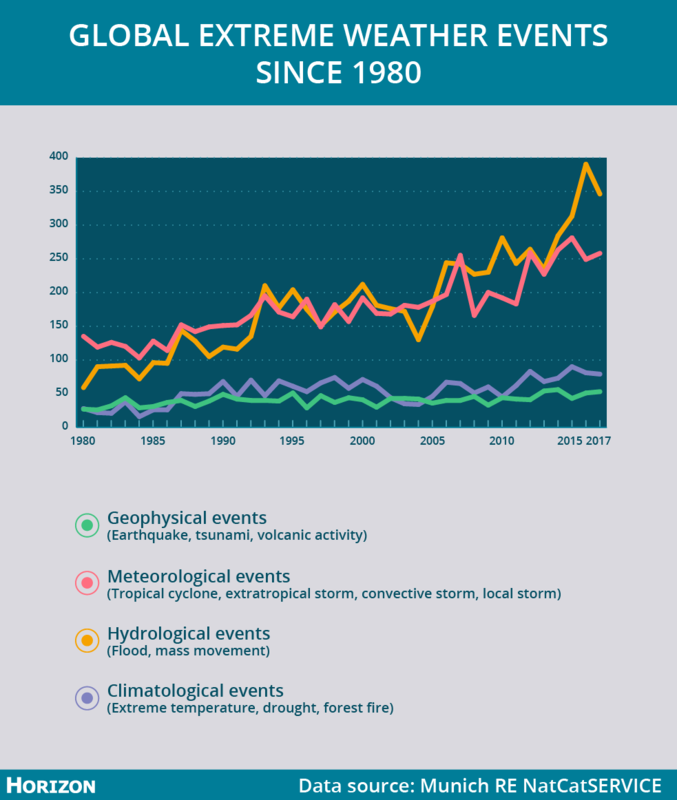 Image credit - Horizon" src="https://horizon-media.s3-eu-west-1.amazonaws.com/s3fs-public/IMCEUpload/extremeweather-world.png" alt="On average, the number of hydrological events such as floods around the world quadrupled between 1980 and 2017. Image credit - Horizon" width="983" height="1162" /></p> <p>One of RESIST’s solutions to this problem is called the Remotely Piloted Air System (RPAS). The researchers are planning to use a series of drones and sensors to continually monitor the environment near the tunnel and bridge during periods of intense weather, and check for any issues as early as possible that may result in a closure.</p> <p>‘It’s going to inform people about the situation, and help with their planning,’ said Dr Amditis. ‘And the project is going to use drones and sensors to understand exactly what type of measures need to be taken after the event.’</p> <p><strong>Breakdown</strong></p> <p>Such alert systems are not widely in place at the moment, and even when they are, one crucial problem is that these severe events can often be followed by a breakdown in communications networks. RESIST’s idea is to build alternative communications networks, which can spring into action during these events and send information both to the public and to emergency services.</p> <p>The ultimate goal is to improve safety for the public. RESIST wants to provide people with up-to-date information, so that they can plan an alternative route if needed or, in the worst situations, avoid travelling altogether. And as extreme weather events increase in the future, such an early-warning system could be crucial.</p> <p>But while tunnels and bridges are key pinch points, our everyday transport network will also need to be able to cope with extreme weather. Dr Belén Riveiro from the University of Vigo in Spain, is running a project called <a href="https://cordis.europa.eu/project/rcn/216011/factsheet/en" target="_blank" rel="noopener noreferrer">SAFEWAY </a>that looks at several sections of road and rail across Europe to see how they cope with severe weather events, and how we can plan for disasters.</p> <p>Her aim is to decrease by half the time it takes for emergency services to arrive on a scene if needed, and reduce by a third the time taken to repair roads or rail.</p> <p>‘We want to integrate new monitoring technologies, including remote sensing and information provided by humans, to have a more efficient monitoring system,’ she said. ‘The idea is to improve the resilience of our transport network when these kind of events happen.’</p> <p><img class="@alignleft@" title="In Europe, the number of geophysical events such as earthquakes has stayed fairly constant since 1980, whereas the number of meteorological, climatological and particularly hydrological events has increased. 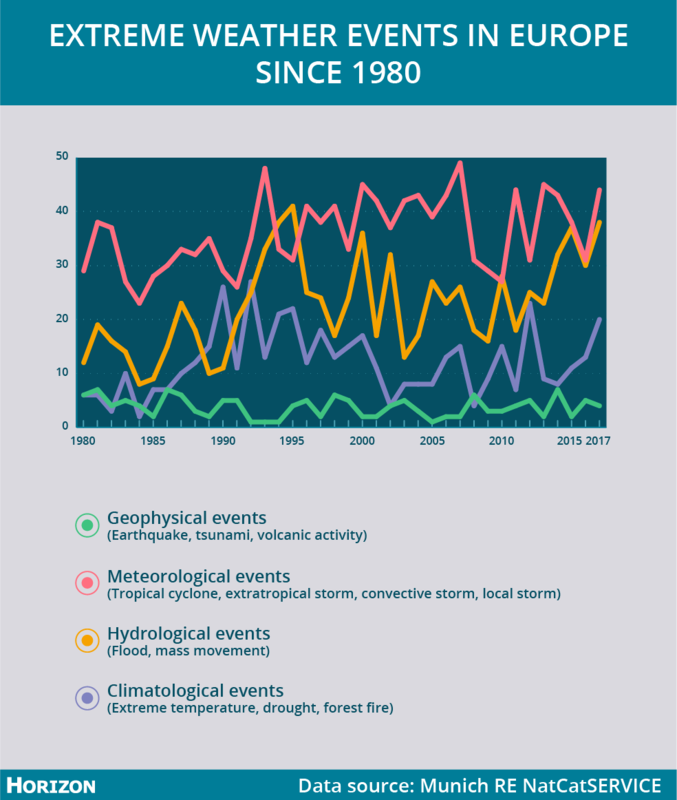 Image credit - Horizon" src="https://horizon-media.s3-eu-west-1.amazonaws.com/s3fs-public/IMCEUpload/extremeweather-europe.png" alt="In Europe, the number of geophysical events such as earthquakes has stayed fairly constant since 1980, whereas the number of meteorological, climatological and particularly hydrological events has increased. Image credit - Horizon" width="984" height="1162" /></p> <p>Through the&nbsp;project, which began in September 2018 and ends in February 2022, scientists will run a number of test projects across Europe. In total, SAFEWAY hopes to collect real-time data from 5,000 billion passenger-kilometres across Europe.</p> <p>One study in Portugal will look at several sections of road and rail in the regions of Leiria and Santarém, which are at particular risk of wildfires and flooding. Here researchers will assess the threat posed by such events to the transport network. They want to use real-time data from people to monitor traffic, and even track posts on social media, to see if any routes have been affected by weather.</p> <p>Another study in the Murcia and Málaga regions in Spain will use similar methods to monitor the risk from earthquakes. In the UK, researchers will study the risk posed by landslides and flooding during heavy rainfall, using satellite data to monitor regions that could be at risk of landslides. A final study in the Netherlands will practise how best to communicate this information to users, such as using smartphones.</p> <p>‘It is important to be able to anticipate the occurrences of these events, or anticipate the effects it can have for the users,’ said Dr Riveiro. ‘We can see every day the effects of climate change are getting more severe.’</p> <p><em>The research in this article was funded by the EU. If you liked this article, please consider sharing it on social media.</em></p> <br /> <img src=”http://www.google-analytics.com/collect?v=1&tid=UA-40077089-1&cid=preparing-for-extreme-weather&t=event&ec=republish&ea=read&el=preparing-for-extreme-weather&cs=republish&cm=republish&cn=republish&cm1=1" /> This post <a href="https://horizon-magazine.eu/article/preparing-extreme-weather.html">Preparing for extreme weather</a> was originally published on <a href="https://horizon-magazine.eu/">Horizon: the EU Research &amp; Innovation magazine | European Commission</a>. Most scientists predict that climate change will lead to worsening weather. This could include more severe snow storms, heavier rainfall and wildfires. These can have disastrous effects on our transport network, causing critical tunnels or bridges to close and, in the worst circumstances, leading to injuries and fatalities. The cost of infrastructure collapse from weather is estimated at €29 billion a year. He is one of a number of researchers who are now studying how we might cope with these situations. They are hoping to develop technologies and methods that can help people and emergency services get real-time information on any serious events, and plan accordingly. Dr Amditis runs a project called RESIST, whose goal is to ensure that critical parts of our transport network can cope with extreme events, both natural ones like weather to human-caused events like cyber-attacks. To do this, the project, which began in September, will be focusing on two important transport routes – the T9 bridge in Greece, and the Saint Petronilla tunnel in Italy – both of which, if shut down, would cause huge problems. A pilot project to test extreme weather resilience will be carried out at the former in February 2021, and the latter in July 2021. Dr Angelos Amditis, Institute of Communication and Computer Systems, Greece. When it comes to extreme weather, these roadways are most at risk from heavy snowfall and rainfall, with flooding in particular being a serious concern. In such cases, bridges and roads can be closed for hours or even days, leaving many people stranded on either side as they are unable to travel. One of RESIST’s solutions to this problem is called the Remotely Piloted Air System (RPAS). 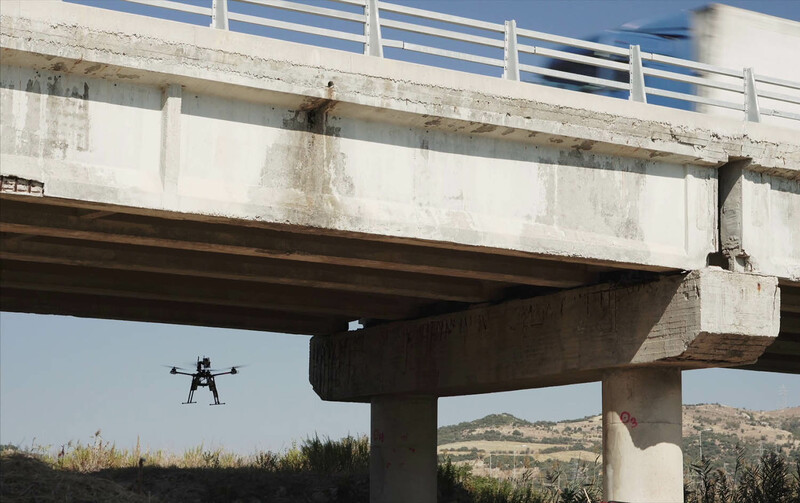 The researchers are planning to use a series of drones and sensors to continually monitor the environment near the tunnel and bridge during periods of intense weather, and check for any issues as early as possible that may result in a closure. Such alert systems are not widely in place at the moment, and even when they are, one crucial problem is that these severe events can often be followed by a breakdown in communications networks. RESIST’s idea is to build alternative communications networks, which can spring into action during these events and send information both to the public and to emergency services. The ultimate goal is to improve safety for the public. RESIST wants to provide people with up-to-date information, so that they can plan an alternative route if needed or, in the worst situations, avoid travelling altogether. And as extreme weather events increase in the future, such an early-warning system could be crucial. But while tunnels and bridges are key pinch points, our everyday transport network will also need to be able to cope with extreme weather. Dr Belén Riveiro from the University of Vigo in Spain, is running a project called SAFEWAY that looks at several sections of road and rail across Europe to see how they cope with severe weather events, and how we can plan for disasters. Her aim is to decrease by half the time it takes for emergency services to arrive on a scene if needed, and reduce by a third the time taken to repair roads or rail. Through the project, which began in September 2018 and ends in February 2022, scientists will run a number of test projects across Europe. In total, SAFEWAY hopes to collect real-time data from 5,000 billion passenger-kilometres across Europe. One study in Portugal will look at several sections of road and rail in the regions of Leiria and Santarém, which are at particular risk of wildfires and flooding. Here researchers will assess the threat posed by such events to the transport network. They want to use real-time data from people to monitor traffic, and even track posts on social media, to see if any routes have been affected by weather. Another study in the Murcia and Málaga regions in Spain will use similar methods to monitor the risk from earthquakes. In the UK, researchers will study the risk posed by landslides and flooding during heavy rainfall, using satellite data to monitor regions that could be at risk of landslides. A final study in the Netherlands will practise how best to communicate this information to users, such as using smartphones.